Last Thursday’s Carmen Bridge meeting – hosted by the City of Cupertino – went well for the city’s first community outreach for this project . There were about 30 +/- attendees – mostly “empty-nesters” and the majority were from the immediate approaches to the bridge. That said, the group was about ~50/50 for/against or maybe a bit higher in support – which was heartening, given there were few school parents in attendance (understood, since it was a school night). There were two SCS parents who were very effective speakers in stating their case for the bridge and clarifying misconceptions – and effectively parried nay-sayers’ “facts” or fears. There were also a number of who were stridently for the project. 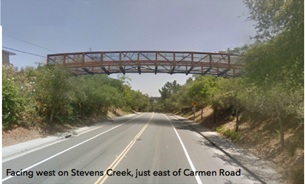 Long time residents who liked the bridge idea – including a number of Carmen residents on the North side of Stevens Creek Boulevard. They thought it was a great idea! They too effectively rebutted the “nay-sayer” points. So, by the end of the meeting, strong emotions calmed down and everyone got to know their neighbors a little better. 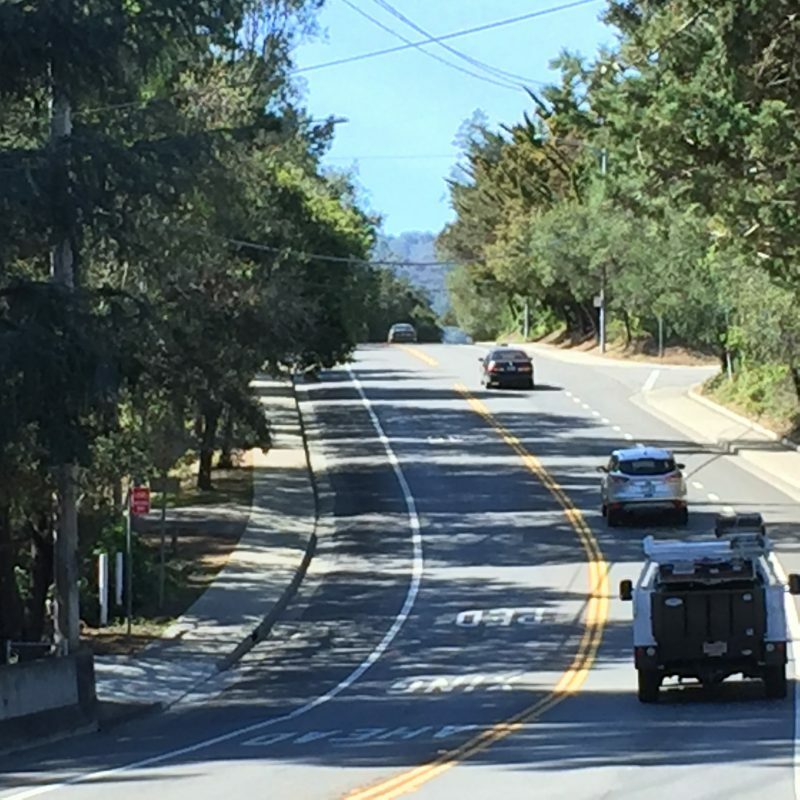 To summarize, the immediate neighbors opposed are concerned about privacy and safety – as it relates to people walking and biking on Carmen itself – which is an understandable concern. David Stillman, Cupertino Traffic Manager, and the city staff surely collected some useful input from all of the attendees. 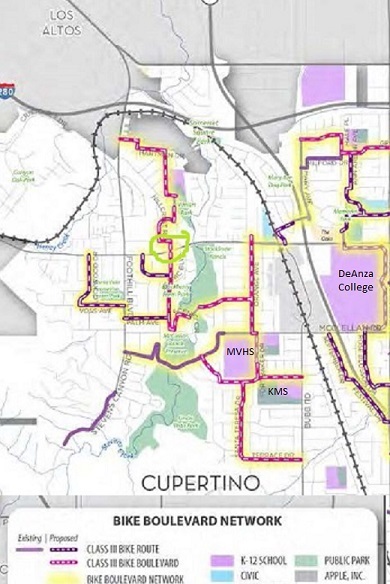 The CUSD FUHSD school district’s data show that ~100 Stevens Creek School and , ~500 Kennedy Middle/Monta Vista High students would benefit from this bridge. It is also a lynch-pin of the city‘s Bike Boulevard network in the Blackberry Farms neighborhood. Other users include park-to-park route users and leisure walkers who would have their neighborhoods reconnected. 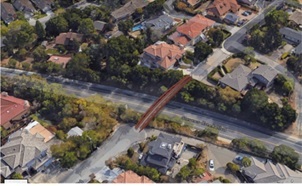 This bridge could really help the congestion issues around Kennedy/Monta Vista/SCS when school opens and lets out each day. Walk–Bike Cupertino has requested the city to capture vehicle counts on SCB, as it is very busy with commuters bypassing and getting back on to the 280/85 in addition to the normal traffic loads. The Carmen Road Bridge Master schedule calls for the feasibility study to go to the city council around July of this year. For those of you who were able to make last week’s meeting – thank you…You made a difference! For the rest of the community who signed last year’s petition of support, (~175 of you), we will have more work to do this Spring as the study takes shape. Your help will be needed to show the community’s support to the city council along with the need and importance for this neighborhood amenity. Thank you for your efforts to make it “Safe and Easy to Bike and Walk” in Cupertino!